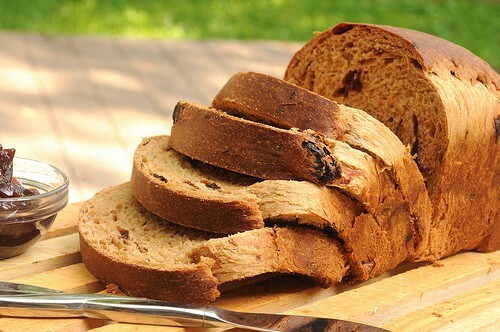 Golden Egg Bread with Dried Fruit has a rather light texture that works well for bread pudding and jelly sandwiches. Mix and knead this recipe in a bread machine (or a stand mixer). Then, bake it in a conventional oven for the most excellent outcome. Fresh-baked bread is aromatherapy for me–right up there with fresh cut grass. Do you agree? Wonder if you can buy it as a room fragrance or scented candle–like new car smell or cinnamon apple pie. Now that I think about it, I’ve never seen it. Guess I will keep baking. 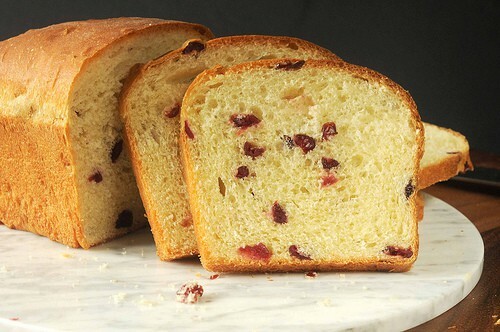 Golden Egg Bread with Dried Fruit is excellent for eating out of hand on the first day. Perfect for bread pudding or toast on day two and three, if it lasts that long. It is not a chewy or rustic style bread but soft and somewhat sweet with a tender crumb. I love eating this bread as part of a sandwich. 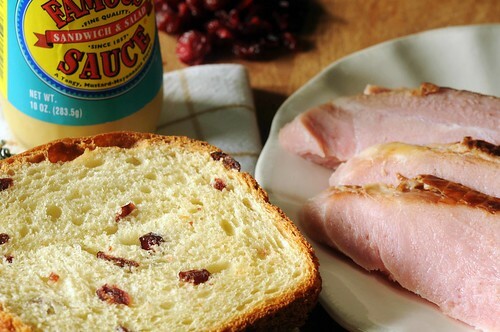 Good with turkey or ham and Durkee’s Famous Sauce. 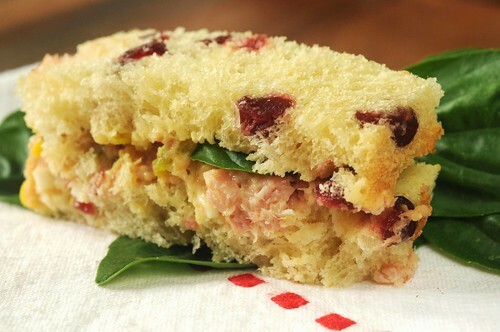 It can transform chicken salad or ham salad into a special treat suitable for a brunch, luncheon or shower. 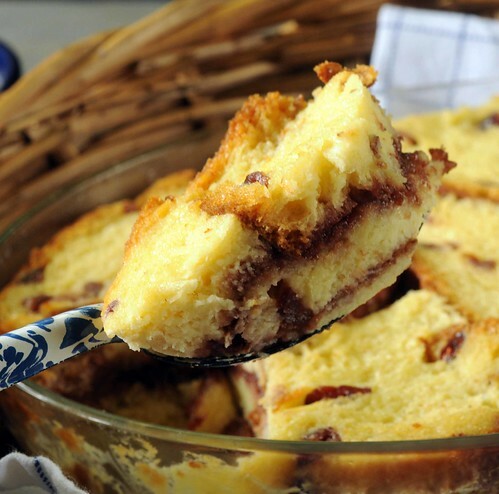 I used it in this week’s Tuesdays with Dorie selection, a delicious variation of bread pudding. The Mother’s Day crowd at my house loved it. You could make this bread without it, but dried fruit takes it from the blue ribbon category to grand champion-purple-ribbon status. Below, you can see it with dried cranberries. In the top picture, I used dried cherries. How about trying raisins, dates, or dried blueberries? Add fruit close to the end of the kneading cycle. It’s better to fruit at the end of the kneading process preserves the integrity of the fruit resulting in whole fruit pieces and a lighter color as seen in the picture below. Many bread machines have a unique signal to let you know when to add fragile ingredients. Place ingredients in bread machine pan in order given. (If desired, add the fruit at the end of the kneading cycle--see discussion above.) 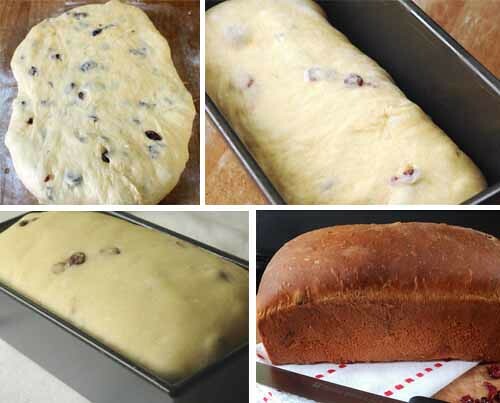 See tutorial here if you are inexperienced with a bread machine. Add additional flour 1 tablespoon at a time if necessary to make dough thick enough to make a ball and barely clean the sides. Set machine on dough cycle. When complete, dough should be doubled in size. If not, let it continue to rise in the machine. Preheat oven to 350 degrees. Bake until cooked through and crust is golden brown--approx 45 minutes. If necessary, cover with aluminum foil during last third of cooking time to protect from over browning. Internal temperature will reach 180-190 degrees when it is done. Let sit on the counter 5 minutes before removing from pan. Cool on a cooling rack. My initial batter was really really watery…. any idea why?? Is it possible you forgot to add all the flour or perhaps mismeasured the liquid or oil? Did you ever hear of adding baking powder to bread dough to make it rise higher and lighter? I made this bread yesterday and LOVED it! Thanks for putting this recipe up! um…. this just looks exquisite! The coloring is nice and warm – you can almost taste it. It’s such a beautifully-shaped loaf. I gave my bread machine away decades ago (that long…?) but I remember how easy it was (and waking up in the middle of the night when it started up)! It’s a great machine – but handmade is also very rewarding…. putting this one on my list! Lemon curd is one of my favorites. So glad it worked out for you. I love using my bread machine, too. It’s so easy to throw everything in their and let it go. Your bread looks great and so versatile, too. What a great looking bread! I bet it was great in the bread pudding! Yum, I think I’d eat this for breakfast. Interesting observation about adding fruit earlier vs. later! ooooooooooo that looks *good* ! ! !